I don’t believe I’ve ever professed my love for ground meat here before. So here it is: I love it. All kinds and all ways: meat sauce, turkey meatballs, meaty ziti, meatloaf, and more. It’s probably a texture thing. Whatever the reason may be…love love love. 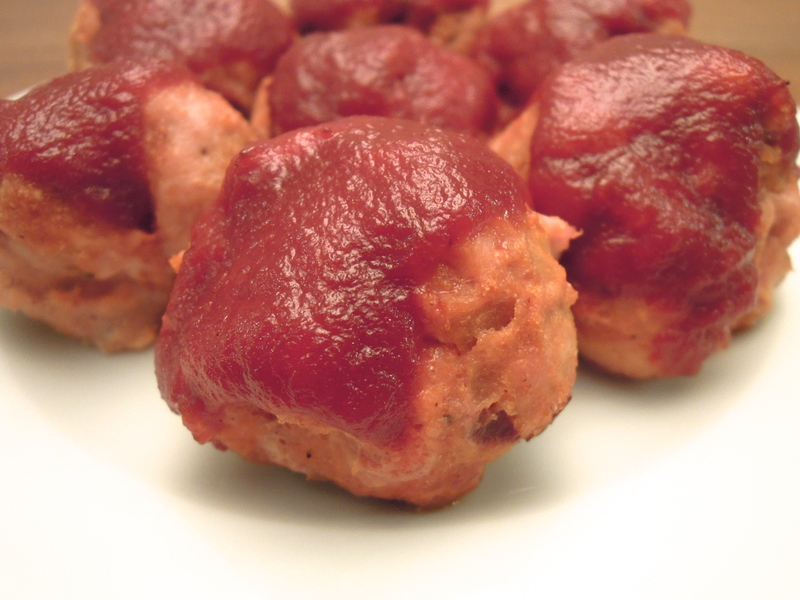 Recently, worlds collided and lead to this newest creation: turkey meatloaf meatballs. It’s everything you love about turkey meatloaf plus some delicious surprises such as chopped chipotle in adobo for a punch of flavor and heat, but in cute meatball form. Because food should always be as adorable as possible. If you’ve always associated meatloaf with cardboard or something worse I promise this will change your mind. There are just so many layers of flavor in every single bite. There’s sauteed onion, shallot, and garlic with thyme, worcestershire sauce, and other yumminess. Add that to ground turkey, the chipotle peppers, other goodness, and mix. Really get your hands in there. 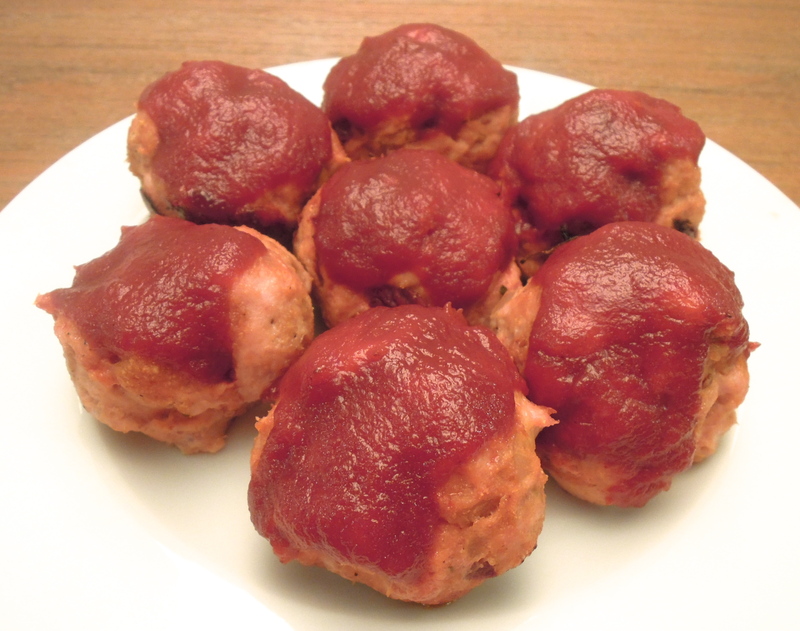 Form palm-sized meatballs, place each one in a muffin tin slot, and top with a mixture of ketchup and adobo sauce. POW! It makes an awesome dinner, but I love eating the leftovers for lunch, too. There’s nothing like a healthy dose of protein to power you through the afternoon. In a skillet over medium-high heat, add about 1 Tbsp olive oil. Add onion, shallot, garlic. Saute about 10 minutes until onion is softened. Add salt, black pepper, thyme (or dried thyme & dried oregano), worcestershire sauce, chicken stock, and tomato paste. Stir until combined. Cook about 5 minutes. Remove from heat. In a bowl, add ground turkey, beaten egg, bread crumbs, and chipotle peppers. Add onion mixture. Using your hands, mix until totally combined. Spray 2 muffin tins with cooking spray. Form palm-sized meatballs with your hands and place one meatball in each muffin slot. Bake 20 minutes. Meanwhile combine ketchup and adobo sauce in a small bowl. Remove pan from oven at 20 minutes, top each meatball with the sauce, return to oven and cook 5 to 10 minutes more until cooked through. This entry was posted in Poultry, Turkey on November 4, 2013 by Paige Greenfield.